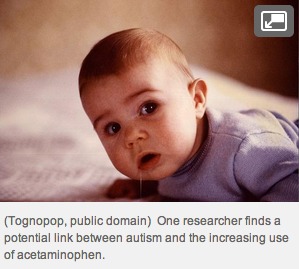 Is Acetaminophen Behind The Autism Epidemic? Although Cuba’s per capita income is about eight times lower than that of the U.S., the percentage of its population with autism is also lower — a surprising 298 times lower. Dr. William Shaw, who has supervised departments in endocrinology, nutritional biochemistry, toxicology, and immunology at the Centers for Disease Control and Prevention (CDC) and other organizations, hypothesizes that the increased rate of autism, as well as rising rates of asthma and attention deficit hyperactivity disorder, may be caused by an increased use of acetaminophen. Acetaminophen, a pain reliever and fever reducer, is the active ingredient in Tylenol as well as other medications. Among the controversial topics he covers in his latest work of research is the potential connection between autism and vaccines — or more correctly, the connection between autism and the fever prevention therapies recommended before and after vaccinations. Vaccines or OTC Drugs to Reduce Fever? Although vaccines are technically optional in the U.S. — mandatory for children enrolling in school — vaccines are compulsory throughout Cuba. In fact, Cuba boasts one of the most highly vaccinated populations in the world with a rate of inoculation against measles at 99.7 percent. This certainly tops the estimated worldwide rate of 84 percent among 1 year olds in 2011 reported by the World Health Organization, which also found the rate of measles vaccination to be 90 percent in the United States. Declining to enter the debate on whether vaccines contribute to autism, Shaw wrote “a topic much less frequently addressed in association with autism is the therapies that are given in conjunction with vaccines.” A widespread practice among American pediatricians is to prescribe acetaminophen, which is a Food and Drug Administration-approved over-the-counter (OTC) medication, as a prophylactic fever preventative. Yet, it is quite uncommon in Cuba, where it has never been approved for OTC purposes. In Cuba, when a high fever persists for more than two days after a baby is vaccinated, parents are advised to bring their child to a physician who can then prescribe metamizole. Although used in many countries, this drug is banned in the U.S. because of an association with agranulocytosis, a condition where the bone marrow does not make enough white blood cells. In fact, Shaw noted that some American physicians even advise parents to give their children acetaminophen on a daily basis during a five-day period prior to childhood vaccines. Some of the children placed on this kind of pre-treatment schedule “had an autistic regression that began prior to vaccination,” Shaw concluded. Currently, theCDC recommends infants be immunized before the age of 2 against 14 vaccine-preventable diseases. Although some of the evidence presented in this paper may be anecdotal rather than scientific, his overall hypothesis is certainly worthy of further investigation. Acetaminophen is the active ingredient in Tylenol’s formulation for infants. The Baby Center refers to acetaminophen as one of the most common drugs given to children. Yet, it also provides a chart to help parents understand proper dosages for this drug, which its Medical Advisory Board deems to be among the ‘hardest to give correctly.’Mayo Clinic also warns against improper dosage of acetaminophen, which can overload the liver’s ability to process the drug safely. Although neither group suggests a connection to autism, the potential for harm when giving an infant improper dosage always exists. Along with his research and work in the areas of childhood illnesses and disorders, Shaw is the stepfather to a child with autism. Source: Shaw W. Evidence that Increased Acetaminophen use in Genetically Vulnerable Children Appears to be a Major Cause of the Epidemics of Autism, Attention Deficit with Hyperactivity, and Asthma. Journal of Restorative Medicine.2013.